The figure is not drawn to scale. PQ and MN are straight lines. Find ∠a . ∠MOQ = ∠MOR + ∠ROQ = 90° + 48° = 138°. PQ and MN are straight lines. 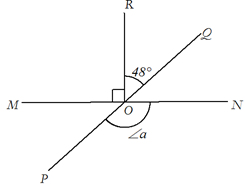 So ∠PON and ∠MOQ are vertically opposite angles. ∠a = ∠MOQ = 138°.